Wild Grass, originally uploaded by ZackTwin. This is another photo taken on the way to Yaku Shoji Temple. 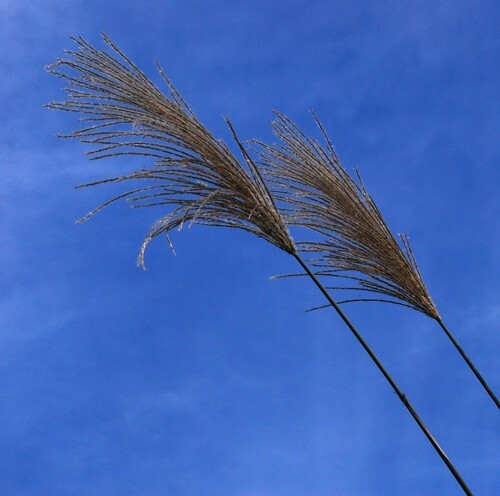 I saw wild grass roadside and took this photo with the background of blue sky. I edited this photo with GIMP to get nicer blue sky. I am using GIMP as image editing software even though it is not user friendly. I want to use Photoshop but it is expensive for me. At the same time, I do not want to use pirated copy because I feel that I should be more sensible as I am working in software industry. This is just my feeling. No offence. By the way, a friend from Japan visited Singapore on last Saturday. So last Saturday was like international friends reunion day for me. I met with New Zealander friends from Australia for lunch and this Japanese friend for dinner. He is very friendly and nice man. When I visit to Japan, he gave us a treat in a Tofu restaurant in Tokyo which is really exclusive. The tofu they served was fantastic as well as fish. This is my turn to ask him what he would like to have for dinner. He said anything is ok. So I suggested we would have a nice Indian food for dinner which is delicious and not very spicy. I brought to an Indian restaurant in Boat Quay to have dinner. The food is good while the talk was better. We were making jokes and laughing until our cheeks were tired. The price of food is pretty expensive compare to the service we got. Too bad, I forgot the name of the restaurant but I remember if I see that again. I should take note shop information if I want to write about it. I will do that so in future.